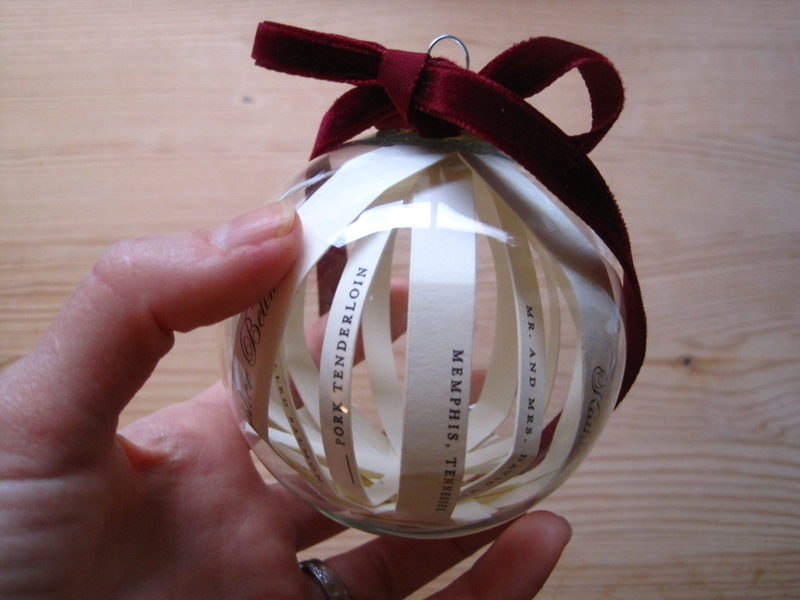 Ages ago I saw a glass ornament filled with curlicued slivers of a wedding invitation. I bought glass ornaments last year expressly for this purpose, but I just now made mine this year. And I love it! 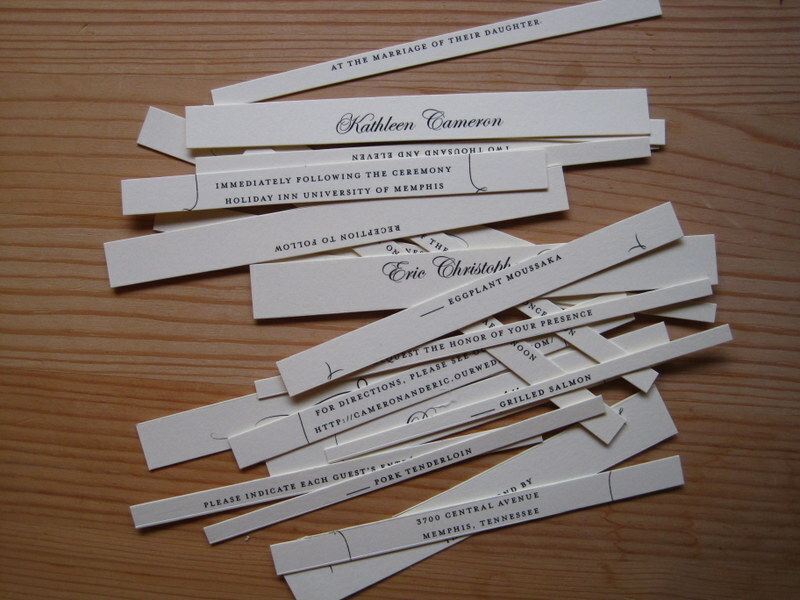 I used all the elements of our invitation (and oh, how well I remember stuffing them into envelopes!). I used my paper slicer to get the cuts even. Instead of rolling them, I just curled them slightly, and then I tied some beautiful velvet ribbon around the top (Eric’s mom sent it to me!). I am a big fan of the striped effect. 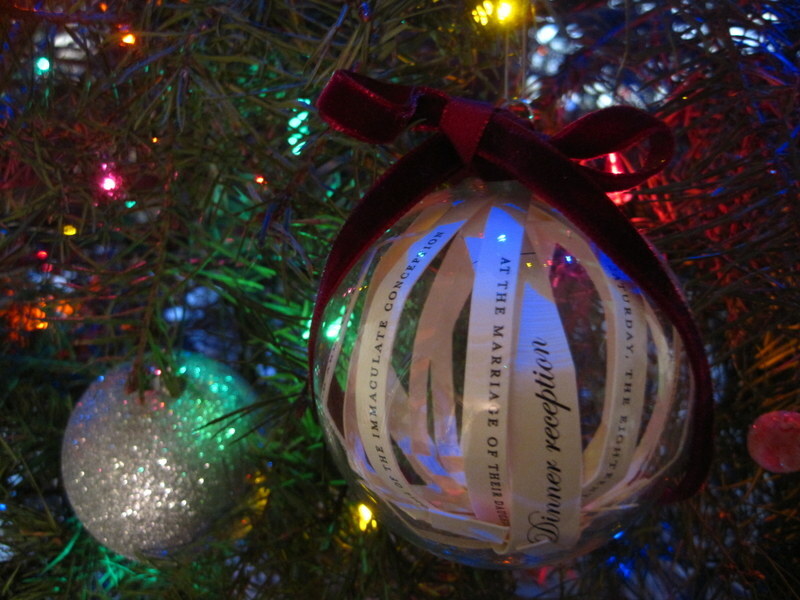 I love having this on the tree–even just holding the invitation in my hand reminded me of all the magic of that day, and I know that feeling will only grow as time goes on. This is FABULOUS!!!!! From now on this is what you should give your newly married couples. If they celebrate Christmas. If they don’t you can use the same concept. Just wrap around a dreidl, (sp) or other holiday decor! Thank you! I was really happy with how it turned out. And a great idea for a gift! Oh my gosh. That is incredible. Oh, I just love this! What a treasure! I also like Moriah’s idea. 🙂 I feel very honored to have gotten to contribute. This makes my heart feel all Christmas-y and also transports me right back to a fabulous day in Memphis! Splendid, just splendid!!!!! Thank you so much! I just love that ribbon, and I have all kinds of ideas for it:) Can’t wait to see you soon! Seriously? BEST IDEA EVER. I can finally put all our leftover wedding invitations to good use! You are so creative! Aw, thank you! I know, I have like 50 more of ours…but at least this made good use of one of them!